R.E. Warner Past Chairman and President, Dave Sminchak, Honored for 33 Outstanding Years of Service | R.E. Warner & Associates Inc.
On Wednesday, August 5th a retirement celebration was held for David Sminchak, past chairman and president, honoring his successful leadership contributions to the firm for more than three decades. The crowd attending the reception honoring Dave’s longtime service included clients, friends, family and co-workers. Vice President, Brett Neff thanked Dave for his leadership, mentorship, friendship and the opportunity to follow in his footsteps as the Manager of Business Development. 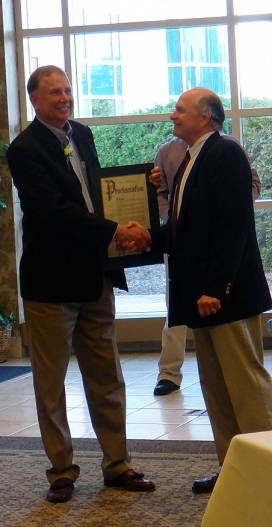 The Honorable Mayor Dennis Clough, City of Westlake, presented a proclamation honoring Dave, and thanking him for his 33 years of dedicated service to R.E. Warner and the Westlake community. Dave joined R. E. Warner in 1982 in the newly created position of Business Development Manager. At that time, R.E. Warner had a staff of 27 and by 1992, R.E. Warner had grown to well over 100 employees. In 1984 Dave was elected an Associate and Vice President and member of the Board of Trustees in 1986. He was elected President of the firm in 1994 and Chairman in 1995. Prior to joining R.E. Warner, Dave served as Marketing Manager for the Pipe Division of Price Brothers Company. From 1972 to 1976, he served as a design engineer and project manager for Paul A. Frank & Associates, a civil engineering and surveying firm. Dave has a Bachelor of Science degree in Civil Engineering from Purdue University and is a Registered Professional Engineer in the State of Ohio. Over the years of his professional career, he has been extremely active and engaged in many professional and community organizations, such as: Leadership Cleveland Class of 1997; Cleveland Engineering Society (president), American Council of Engineering Companies of Ohio (member of the Board of Directors), Bluecoats, Inc.; Build Up Greater Cleveland (member and former chairman of the Human Resource Task Force); Marymount Hospital Community Advisory Council; and the Cleveland Zoological Society Development Committee. Dave also authored numerous publications and participated in many speaking engagements. “Dave has shaped our firm into an industry leader. He has been a tireless worker and advocate of our firm since the moment he came here so many years ago” toasted Ted Beltavski, current President of R.E. Warner. All of us at R.E. Warner, congratulate and thank Dave on a wonderful career and for his important contributions to our company.